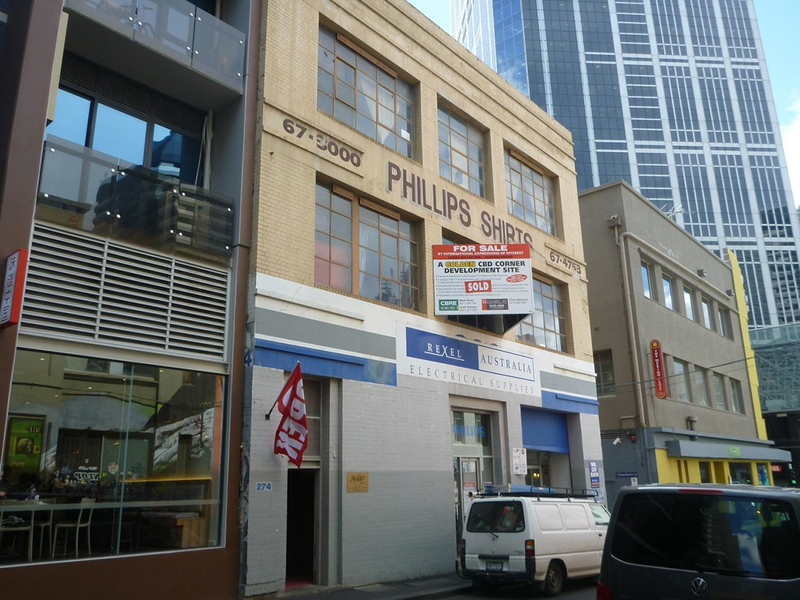 Today we look at a planning application for a 59-storey residential tower on the site of Phillip Shirts at 274-276 Little Lonsdale Street. The Peddle Thorp-designed tower would join two other recent projects for Brady Corp in Melbourne Sky and Melbourne Star as it shares a boundary and obscures the latter's eastern wall. Approval is sought to demolish the majority of an existing three storey brick building to accommodate the apartment tower. 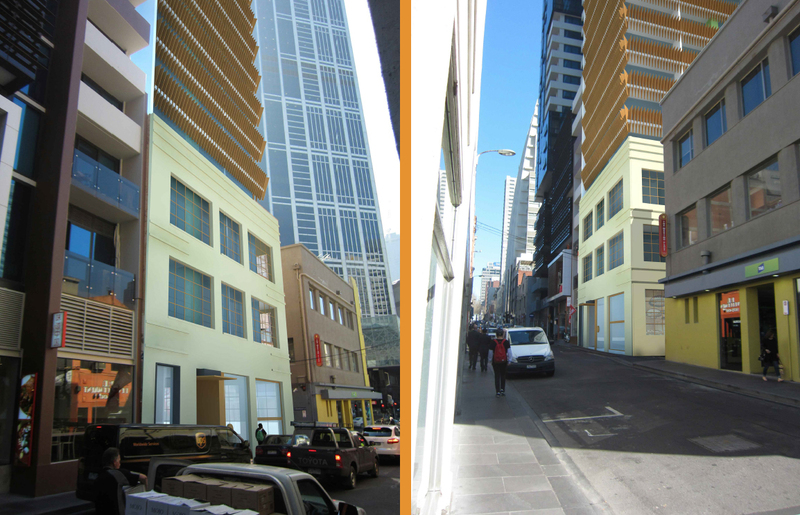 The existing façade will be retained along the Little Lonsdale Street frontage and will continue along Zevenboom Lane for approximately 17.4 metres. A good outcome considering it has been identified as having little heritage significance. Whilst it is noted this façade has not been heritage listed, it is considered that this existing façade contributes positively to the streetscape (including in terms of scale and rhythm of window openings) and is worthy of retention to enhance the streetscape address of the site. Furthermore, its adaption will form an appealing feature of the proposed development scheme at the site. A wrap of two ground level retail tenancies addresses the Little Lonsdale Street and Zevenboom Lane corner. The main entry lobby, loading facilities and other ancillary services complete the ground floor with bicycle parking and car parking reserved for the four basement levels. This wouldn't be of concern unless you factor in the site footprint relative to some of the other towers of similar height. At 735sqm the site is significantly smaller than the foortprints of Melbourne Central and the future development at 380 Lonsdale Street. These towers also have frontages along major CBD streets whereas the development is within a largely small scale 'neighbourhood' defined by red brick low-rise buildings bisected by a network of laneways. The main tower element rising behind the retained facade shares an aesthetic quality with its older yet shorter siblings to the west. Sheer glazed curtain walls are interrupted by the revealing of balconies behind. Similarly to Australia 108 the facade features a stripped gradation from top to bottom with the stripes becoming incrementally more contracted towards the tower's pinnicale. This volume above a 'podium' with a furrier treatment involves a bronze coloured veil similar to original designs for another Peddle Thorp design, Vision tower at 500 Elizabeth Street. This splash of colour continues to the western boundary of the tower in the form of solid spandrels which rise up the remainder of the tower. 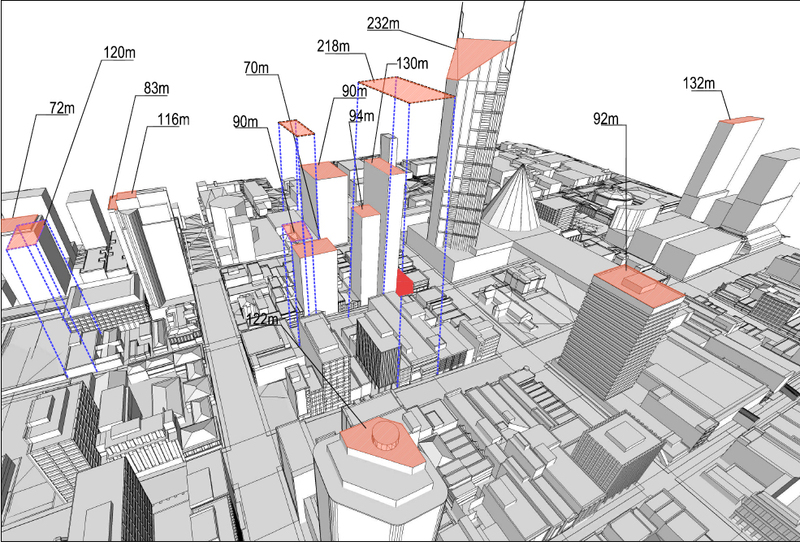 The proposed development continues the recent trend of large scale high-rises encroaching on the relatively low scale streetscapes which define Melbourne's 'Little' streets and laneways. I've always been a proponent for skyscrapers in the CBD, I won't shy away from that fact, however I don't consider developments of this scale to be appropriate responses to the character and grain of these areas. The footprints of these sites is generally much smaller than the larger sites on the primary CBD streets. This results in narrow skyscrapers with two shared boundaries that if built to the extremity as usually tends to occur, creates a 'wall' effect that is amplified on much smaller streets from a pedestrian perspective. I don't consider this to be a desirable outcome and would invite anyone to tell me otherwise or convince me that these are the type of streets we wish to create moving forward. The benchmark for development in these smaller scale streets should be the more modest additions found on McKillop Street or Hardware Lane - unobtrusive yet worth tilting your head up to appreciate. Leave the big towers to the major streets and their intersections. Your analysis is spot on, Laurence. The only thing I would add is that the retention of the heritage street façade, while worthy in itself, doesn't address the major heritage values of the site - i.e. the existing low-scale historic frontage to Zevenboom lane. This could have been another perfect red-brick laneway frontage to activate with small scale lane-front shops and tenancies of various kinds. If this tower goes ahead, it will be a dark, characterless, forbidding space in the central city - and one of a growing list of once-on-a-lifetime lost opportunites in Melbourne planning. I agree that it's too imposing for a "little" street however am pleased they are maintaining the frontage .. that's one trend I wish would take off in our city. Yes, but are they maintaining the character of the frontage? And are they maintaining enough of the red brick lane way frontage (lane ways are equally important as main "streets" in Melbourne these days). The answer is no. The plan appears to be to render and paint the red brick facade and demolish most of the historic lane scape. Honestly, with the grief, the accumulated grief and grinding of teeth that this has caused over decades and over thousands of people, maybe we should have gone 'La Defense' many decades ago. Left the Pre-war or rather pre-depression Melbourne 'as is' inside its Hoddle Grid and Hoddle Plan suburbs. And then expelled the railways and freight forwarders from Docklands and West Melbourne a long time ago, and built a New Melbourne all shiny and tall. Indulged the NIMBYs and the establishment with their fetish for old buildings, but equally allowed Melbourne to grow and prosper with new development and new designs that suited the modern age. And put in place that none of that would ever be heritage listed - made it explicit that the buildings in New Melbourne would be time limited by market conditions. Prof Miles Lewis flaited that as an 'if only' many years ago though he proposed the latrive street as the place for our la defense - which makes / would have made sense with the 2 city loop stations there - but the demolitions in collins St (the golden mile) started in the late 50s, development frenzy started in the early 60s, so would have been a very brave state govt or town council to have said 'no' in say 1960 - a time when not only Victorian was seen as ugly, but art Deco was seen as gaudy ! Few heritage protection regimes anywhere - though I guess 'the Paris end' could have been seen as beautiful enough to be worthy of preservation. Yes, that would have been a reasonable idea. I'm not sure that heritage advocates would have such a problem with demolishing certain historic buildings if we were seeing quality contemporary design replacing them, however. Unfortunately in the main, in terms of their design and liveability characteristics, the historic offers much more to our contemporary cities than the new. Riccardo, your ideas are curious. You seem to be suggesting that historic buildings have no place in the "modern age" (however we define it - arguably "modern" began in the 1700s). Had we gone down the route proposed, yes, we would have had one of the most intact and remarkable Victorian cities in the world, with the "modern" city sitting to one side. But there would still be arguments about what to retain and what to demolish in both the old and "new" urban areas as time went on. La Defense is only 50 years old, so it is only now entering the period where citizens might start to look at the heritage of its buildings. With the new plan for La Defense in preparation now (a kind of urban renewal plan, ironically!) it will be interesting to see how this debate develops. The whole point about heritage, however, is that it evolves with society - you can't (or shouldn't) prescribe rules about what people value or don't value 50, 100 or 150 years ahead of time. "The market" is no more sacrosanct than any other dimension of our society - it is a function of human laws, values and movements, as much as our built environment is a function of them. As a society, we make all kinds of decisions about when and how to overrule market forces all the time. Who knows, we might one day decide to abolish or adapt "the market" as we understand it today. Of course some would you wish to "preserve" aspects of the market for future generations, arguing that it is good for society to do so. But we wouldn't want to see the market as a museum piece, forever preserved as sacrosanct and unchanging, would we? There is no market. Just people who want to buy and sell things. "you can't (or shouldn't) prescribe rules about what people value or don't value 50, 100 or 150 years ahead of time." Well, we do. We decide that the built form of 70-170 years ago is to be prescribed over future living and working patterns indefinitely. No we don't. Heritage overlays are like any other kind of design overlay - they place controls on the ways that heritage buildings can be modified by owners. They offer a quite a good deal of flexibility in terms of altering buildings, and they themselves can be modified or abolished, depending on government requirements and social expectations (one only has to look at recent development in Melbourne to know that this is true). What Riccardo seemed to be suggesting was that we delimit some areas as "no go"for future heritage overlays.